First I'll do one of my favorite things and announce the winners of my blogversary giveaway. Congrats! E-mail me your addresses so I can send you your books. Carmen, I don't have your e-mail so e-mail me by the end of Wednesday or I'll have to pick another winner. Today I’m excited to interview 15-year old Jenna Gustafson, a published debut middle grade author, for my Ask The Expert series. Her middle grade novel, SAVING FORT SMOKY, was published November 10, 2010. I found out about Jenna through Shannon O’Donnell at Book Dreaming, who did a blog post about meeting Jenna and asking other bloggers to spread the word about her book. If you don't follow Shannon's blog, I really recommend that you do. There's only one hope for Fort Smoky to survive. After a devastating fire ravages the homes of Fort Smoky, it's up to young Ben Clearwater and his sister and friends to help the residents and get to Fort Futureland to save the people before the harsh, cold winter sets in. To get there, they will have to trek through unknown mountains, relying on Running Wind's compass and Big Jim's maps of the land while struggling against the harsh forces of Mother Nature. Fort Futureland is a place of new and interesting contraptions, like cars and computers, the four children have never seen, and they are captivated. But the children soon uncover a sinister plot to destroy their beloved Fort Smoky. Will they be able to stop the evil leaders of Fort Futureland? Will they ever make it home? Will they be heroes for Saving Fort Smoky? Join young author Jenna Gustafson in this action-packed adventure of four friends teeming with courage, bravery, and determination. Readers will be caught up in this action-filled, futuristic adventure as they follow Ben, his sister, and friends while they struggle to save their home and family using their skills and cunning. It's an enjoyable read for upper elementary students. Sheryl Stansbury, media specialist, Washington Middle School Jenna Gustafson lives happily in Montana with her parents and brother. While she has won local short story contests, this is her first book. She hopes to inspire other children to chase their dreams and understand that they are never too young to accomplish something. Hi Jenna. Thanks so much for joining us. 1. Please tell us a little bit about yourself, your school, and how you became a writer. I am Jenna Gustafson, a small town girl who loves nothing more than to bury herself in a good book or go on an invigorating hike. I have a little brother named Jade who I do everything with, a wild imagination, and a go-big-or-go-home personality that is awestruck by God. Over the years I have poured myself into my friends, dance, cross country, and track. I take a certain pride in my academics, and I enjoy my high school, where the student body and staff combine to look like a large, weird, and sometimes dysfunctional family to any outsider. I am particularly fond of art (illustration) and the sciences. English has always been an easy A for me, but oddly, this is not where my love for writing began. In about fifth grade I received a diary for my birthday. I found that I express myself the best on paper, and from then on I have carefully recorded all my adventures and misadventures. Writing, for me, is freedom at its finest. 2. Wow! It sounds like you have a lot of interests. I read that you wrote SAVING FORT SMOKY in 7th grade. How long did it take to write the first draft and how many revisions did it go through before you tried to get it published? My seventh grade advanced English teacher essentially launched my writing career by giving our class a short story assignment. The first rough draft of my story was completed after about three weeks of spin-as-you-go plotting and countless hours of typing. Did you know that after a certain amount of time on Microsoft Word, a prompt actually reminds you to stretch your fingers and avert your eyes from the screen?! As deadlines for the class drew near, I reluctantly ended my story. It was then poked, prodded and remolded in the following three weeks for the A. Later that summer I added a more meat to the manuscript before I sent it to the publisher. I would say it went through about six rounds of editing before the final proof was submitted. 3. That's so awesome how you were able to get the draft and then the edits done so quickly. And what a great idea to work on edits over the summer. How did you come up with your idea for your story and the idea of the less modern Fort Smoky and the futuristic Fort Futureland? When I wrote Saving Fort Smoky I was in a profound Louis L’Amour phase, and was primarily reading shoot em’ up westerns. Naturally, this style found its way into my writing. I have always been intrigued by fantasy as well, and decided to throw a monkey wrench in the preconceived idea of how westerns “had to be” and added my own spin into my tale for fun. The story seemed more unique and less faceless when I placed a touch of future in a historical setting. Hence, Fort Smoky and Fort Futureland sprang to life. 4. Tell us a bit about your road to publication and how you found your publisher. The summer after my little story was born, my resolve to get it published hardened, and I spent every waking hour researching everything publishing; agents, self publishing, traditional publishing, and the pitfalls of all. Call it a three month homework assignment. I placed all my data in a spreadsheet format and scrutinized the differences between the trustworthy companies I had found. The problem? Most of the companies at the top of my list were of the self publishing variety, and cost an arm and a leg. This was because I didn’t want to risk getting an agent and spend unnecessary money to get accepted by a high profile traditional publisher. I wasn’t looking to get into the big leagues. I wanted a start where I could make back the money, learn about entrepreneurship, get good publicity, and keep my rights. Awfully high expectations for a seventh grader, and the self publishers just weren’t cutting it. Finally, near wit’s end, I stumbled across Tate Publishing, a hybrid. This company demonstrated self publisher and traditional publisher characteristics, accepted few, and took their business seriously. Before submitting my manuscript I doubted my story’s worth and questioned what I was doing in book world a few times, but in the end I leaped for the opportunity, and by some miracle, managed to drag my parents along for the ride. I’m sure you can imagine they’re reaction to all this. After much debate, they decided to back me on the euphoric day I got my acceptance letter from Tate Publishing. Getting published has been a very wild ride, one that taught me many useful skills and made me grow up fast. I don’t regret a thing. 5. You certainly did your research. And it was definitely a well-thought out plan, especially since you were in middle school at the time. I'm impressed. How have you marketed your book and has that changed at all since your book was first published? I was launched out of production into marketing in the fall of 2010. It was in a whirlwind of long hours at local craft shows, school presentations, and book fairs. Business was looking good. Suddenly winter came and the fairs left, vaporizing my marketing strategy. There is only so much a fourteen year old can do with no wheels, no money, and a rural geographic location. I turned to the web for supporters, but my success there was limited. The Internet is a very vast place, and should not be attempted by an amateur without a guide. Luckily, several months later, Shannon O’Donnell took me under her wing and set up a blog tour for me. Now I am working on introducing myself to everyone via interviews like this one. 6. I'm so grateful that I met Shannon too through her blog. She's a great friend. What type of books do you read and has writing changed what you read, if at all? What books are you waiting to be released? My favorite genres to read are fantasy and YA fiction of superb quality. Becoming an author has made me even more appreciative of books, yet my mind has also become more cynical. Nit-picky criticism of plotting, planning, and grammar comes almost second nature to me, and I can’t help but notice good usage of these elements in other people’s work. Books that have been released recently that I am interested in are Inheritance by Christopher Paolini, and Crossed by Ally Condie. 7. Fantasy is my favorite genre too. Do you read any teen book blogs, author blogs, or author or publisher websites? Become a fan of an author on Facebook? Why? Has this changed at all since you started writing? Honestly, I spend my precious spare time reading books only. If I run across an exceptional story, I visit the author’s website to see how they market their books. I am always curious to see what works. Sometimes I also check out the publisher’s website. Before I got published this would have never crossed my mind. I have yet to become a fan of an author on Facebook. I see no reason to impersonally add to the already huge fan base of most outstanding authors. I would rather simply enjoy the book than become a statistic. 8. Having a daughter in high school, I'm not surprised that you don't have time to read blogs or be on the Internet much. Are there things your favorite authors could do that would make you more likely to visit their website, their blog, or become a fan on Facebook? How are you using this knowledge to promote your own book? Authors have to have some kind of addictive material at their disposal to draw readers and fans, such as games promoted by the 39 Clues, juicy/helpful blogs, or contests with prizes. They also must have amazing advertising, and tantalize the readers with bait found exclusively at their website or blog in the back or their books. I would use these tactics if more people knew about my book, but as of right now, Saving Fort Smoky is too unknown for me to really push people in the direction of my website. In order to coax readers, you need readers. These ideas of marketing tend to work far better with oceans of followers. 9. The contest idea is excellent. I've found through blogging that an interview with an author gets way more interest when it's linked to a book giveaway. What are you working on now? Between sports and school, I am gratefully writing posts for bloggers, scheming over my next book, and attempting to generate more sales for Saving Fort Smoky so I can continue down the enchanted road of publication. Thanks so much for all your advice Jenna. 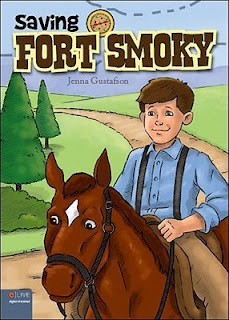 Jenna has generously offered a copy of SAVING FORT SMOKY for a giveaway. Details will be at the end of this post. I'm hoping whoever wins it will help Jenna spread the word about her book by passing it on. And I'm hoping some of you can help her spread the word about her book through your blogs. My daughter's in 9th grade and with homework and sports like Jenna's doing, I know she doesn't have the time we adults do to connect with other authors and book bloggers to market her book. There's too much homework. So if you're interested in interviewing Jenna, e-mail me and I'll forward her e-mail to you. Here's a great opportunity for you to Pay It Forward and help a debut author. I loved this book. The contrast between Aria's world and Perry's is so sharp. It was fascinating to watch Aria, who had lived mostly in a virtual world, have to cope with living in Perry's Outsider world. And watching how their relationship developed, which was definitely antagonistic at the start, felt like a natural progression, which I loved. Trust me, this is a book you want to read. So onto today's contests. Jenna is giving away one copy of SAVING FORT SMOKY and I’m giving away my ARC of UNDER THE NEVER SKY. All you need to do is be a follower (just click the follow button if you’re not a follower) and leave a comment about Jenna's interview by midnight on March 10th. I’ll announce the winners on March 12th. If your e-mail is not on Blogger, please list it in your comment. International entries are welcome. Here's what's coming up. Next Monday I'm interviewing Merrie Haskell and giving away a copy of her debut book THE PRINCESS CURSE. On Friday next week, Casey is interviewing Deborah Blumenthal with an ARC giveaway of THE LIFEGUARD. The following Monday I'll be doing a YA newer releases giveaway. Wow. Published at 15. I can't even imagine. What a great journey, at at such an age, no less! Congrats Jenna! Saving Fort Smoky looks like such a great, genuine book. Congrats on being published at 15! I'm so impressed by Jenna's drive and success. I had dreams of writing at that age, but not the confidence or gumption to even show anyone my work! Thanks for the interview and the giveaways. Wow, that's awesome to be published at 15! I only bet when it's a sure thing, so I bet this young writer has quite a career ahead of her. I admire her drive and her clearsighted approach to her goal. I tweeted about this, Natalie. Thanks for featuring Jenna, and for the giveaways. Amazing. I only wish I had known I wanted to be a writer at age 15. It took me until I was 41. I love reading about authors!!! Especially when I can relate. My English teacher pushed me to be writer as well. And when I say push, I do mean she opened the door to some amazing possiblities. Thanks Jenna for sharing your awesome road to publication and all your other advice. You guys have the best interviews and giveaways here! Wow. I'm so impressed that Jenna not only wrote but also published a book at 15! 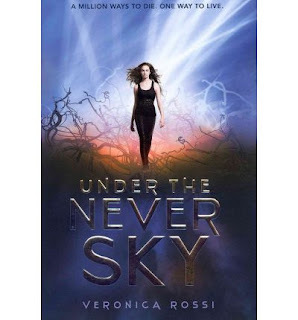 I'd also love to win a copy of Under the Never Sky. This is just wonderful! Way to go, Jenna! I love that can-do-WILL-do spirit and the research you put behind your writing. Loved reading about your road to publication. Love your cover too! wow, congrats on being published as such a young age. It must be great! Congrats and good luck for your career!!! Also, great book for the giveaway! Published at 15? That is amazing. This is what I try to tell all the students at the local middle school and high school when I do writing workshops, you are never to young. Thanks for being such an inspiration. Thanks so much for the book! And Saving Fort Smokey is already on my TBR list. What an inspiration Jenna is. Congrats Jenna! Jenna I wish you every success. I too am impressed by how well you researched on your way to publication. Congrats to all the winners! What fantastic prizes to be found on this blog! You're amazing, Jenna! Congrats on your accomplishments. Wishing you the best with marketing and future works. Writing a book in the 7th grade that gets published is insane.. what a great interview!! What a remarkable young lady she is. And what a terrific interview. Great interview! Those were super tips you gave about blogging and marketing for other authors, Jenna. Thanks! Wow! 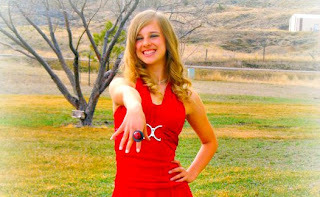 What an amazing 15 year old! Can't believe you are already an author Jenna! I'm actually going to email you about linking up with Jenna. What a big feat for such a young girl. That's some real dedication to want something so badly and get it. Good luck with everything, Jenna! Thanks so much for an impressive interview. What a hard-working, motivated writer Jenna is! She'll go far. I'm amazed too on how fast you finished your drafts and edits. Having a book published is such a huge accomplishment and Jenna is quite young. CONGRATS!!! I would be somewhat scared (and impressed) to see a middle schooler/high school freshman already learning the ropes of entrepreneurship. The best of luck to Jenna! Wow that is truly amazing to be a teenager, go to school, do sports, and have a written a published a book. You are one busy person and that is actually pretty inpsiring. Congratulations on being a published author that is huge. Btw thank you for the chance to win Under the Never Sky I am so dying to read it. Published at 15! That is amazing, congrats! What a great, inspiring story! Good luck to Jenna and thanks for sharing her amazing story! Enter me for the giveaway. I can't imagine how much of courage it requires to set out on the road to publication at such a young age. I really admire authors who've taken such a great responsibility at such a young age. I wish you all the very best in your writing career and hope to see many more of your books published. I would love to be entered into both giveaways:) Thank you! Awesome giveaway and interview! *sigh* to be so young again and full of confidence! It's interesting to know that Jenna spends her time reading rather than following other author's blogs. I can understand why she does that. There are so many books and so many blogs out there that you almost have to pick one or the other to justice to either! Currently I'm trying to do both (I'm a follower)! I'm reading Under the Never Sky right now and it's one of the best dystopians I've ever read. I've also found that I express myself best through writing. Guess that's why I enjoy blogging so much. It's harder for me to write than it is to read. So I tend to read more and forget about writing. Writing a book and getting it published was a huge milestone in life that not every people in the world experience. Simply Amazing! This really looks like a great story. Would love to read it! I'm not the first to say it but WOW - 15! Great interviews.